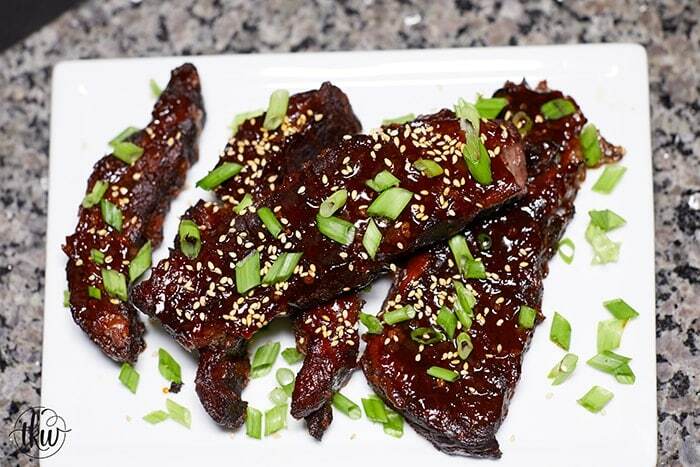 These super tender Korean Gochujang Sticky Boneless Beef Short Ribs are some of THE BEST short ribs you’ll ever eat! This finger-licking sauce is kind of spicy, kind of sweet and a whole lot of sticky in all the best way! WOW! You guys went NUTS over my Korean Gochujang Sticky Chicken Wings (Instant Pot) recipe that I posted last week. And then when I posted a sneak peek of the short ribs some of you DM’d me to death saying I needed to post the recipe next. I so love your enthusiasm; thank you! Short ribs are probably my most favorite cut of beef. Don’t get me wrong as I pretty much can cook the heck out of any cut of beef and it will turn out delicious but there’s just something a bit more special about short ribs. I find them to so much more flavorful and tender. Maybe that explains the price here in Pittsburgh being pretty steep. I’m not one to shy away from spending a bit more on amazing quality. As a chef I know that there truly is a difference between spending $10 a pound for steak at one place and paying $2.99 at another for the “same” advertised piece. Not all cows are the same. You can see the difference in the quality just by looking at the marbling, the fat, the grain and so forth. Just like when you were in school, meat has grades. There are actually 8 quality grades of meat. It’s actually pretty interesting to see how meats are actually graded. Check out the USDA Food Safety and Inspection Services’ (FSIS) website as they give a great explanation about these gradings. The other HUGE factor, besides grading that is equally important, is knowing where your meat comes from, how they were raised, treated, not given hormones. I want a company to be fully transparent with me. This is why I teamed up with ButcherBox. They ensure that the source where their products come from are from animals that were humanely raised, grazed on grass, and were never given growth hormones or antibiotics than simply measure the amount of marbling within a cut. Grain-fed cattle are raised to get fat quickly, which enhances their marbling. Grass-fed cows are leaner, and therefore have less intramuscular fat within each steak. While the USDA beef grades consider this a disadvantage, we look at it as a selling point. We prefer grass-fed beef because they were fed a healthy diet of grass and forage, resulting in a cut of meat that is lower in bad fats and higher in key nutrients. This is coming up! This is my Instant Pot Korean Gochujang Sticky Boneless Beef Rice Bowl. As mentioned a while back part of what I plan on doing this year is showing how my recipes can be used in various other recipes. What I’m doing, for example, with this short rib recipe below is giving you a foundation item. And once you have that, I’ll be sharing ways to transform that foundational item into multiple meals that aren’t repeats. So for example this short rib recipe I made the rice bowl for weekly meal prep, also used it in nachos (seriously Korean nachos are CRAZY legit! ), on a pizza (no for real, you have not lived until you had this on a pizza!) and other ways. This is one thing my Mom was a master at doing. She knew how to stretch a single foundational food and transform it into new and delicious recipes every night. So it never felt like we were eating leftovers. If you made my Gochujang wings then you know. You know! As you can see these short ribs were fork tender. They were so tender in fact that I had a hard time taking them out of the pressure cooker as they were just falling apart. The meat just melts in your mouth that you practicality don’t have to chew. I mean I recommend you actually chew your food but you get the idea. But Mr. Fantabulous went nuts over these. Like the man that, up until a week or so ago never even heard of Gochujang, DEVOURED these! He preferred these over the wings and asked when I was making more. Now, if you can’t find amazing quality short ribs in your area you can use flap meat or even beef shank. And for those that are curious if this works on bone-in short ribs? YES! Just bump up the time another 5 minutes or so and you should be good to go! These would be amazing with rice, quinoa or creamy mashed potatoes. But stay tuned for the rice bowl recipe coming soon! Line a rimmed baking sheet with foil and place a cooling rack inside; set aside. Place your oven rack to the upper third tray. In a large bowl whisk together the soy sauce, sesame oil, vinegar, salt, pepper, chili flakes, Gochujang, honey, garlic, and ginger. Place your short ribs in the bowl and gently toss/stir to coat all of the meat. Allow to rest for 10 minutes. If you’re in a hurry you can skip this part and dump it all into the Instant Pot/Pressure Cooker. Close the lid on your IP, set the cooking time to 35 minutes/High pressure. When the time is up, allow the pressure to release naturally (15 minutes). With tongs, carefully (they will be fall-apart soft!) remove the ribs to the rimmed baking sheet and set the IP to sauté or brown function as you’ll need to thicken up the sauce. Depending on how watery your ribs were your sauce can take 10-25 minutes to get to a thickened state. Just stir often to not burn. The sauce should be thick enough to coat the back of the spoon. Once it gets to that state, remove it from the pot and place in a container to use for basting. Slather the one side of the ribs with the thickened sauce and broil just for a minute as you want to slightly char the sauce but not burn it. Remove from the oven, flip, baste and return to the broiler for another minute. Remove from the oven and sprinkle with sesame seeds and green onions. Store the remaining sauce in the fridge for up to a week. Yes, slather/baste one side with the sauce, broil, flip, slather/baste and broil again. I’ve updated the recipe to remove the word bottom. Can I tell you just how much we love this recipe? I’ve always been intimidated to make or buy short ribs as they are pricey and I didn’t want to ruin expensive meat. But seeing these pictures and trusting you, I took the leap of faith and bought $30 worth. There are just two of us and we literally ate the entire batch in one meal! I made homemade rolls to sop up the sauce as well as put it on mashed potatoes. Lori you are a GENIUS! Thank you for giving me faith! These are absolutely the best short ribs I’ve ever had! Thank you for another amazing recipe Lori!